In this Episode of Oil & Gas This Week: Will Exxon Greenlight This Huge LNG Project?, The New Oil Order, Shale Pioneer Hamm Growth Could Fall by Half, Huge Backlog Could Trigger New Wave Of Shale Oil, Tough Times For Sand Miners and more industry news. Will Exxon Greenlight This Huge LNG Project? As of 2/4/2019 – The American Rig count is 1076 active rigs. 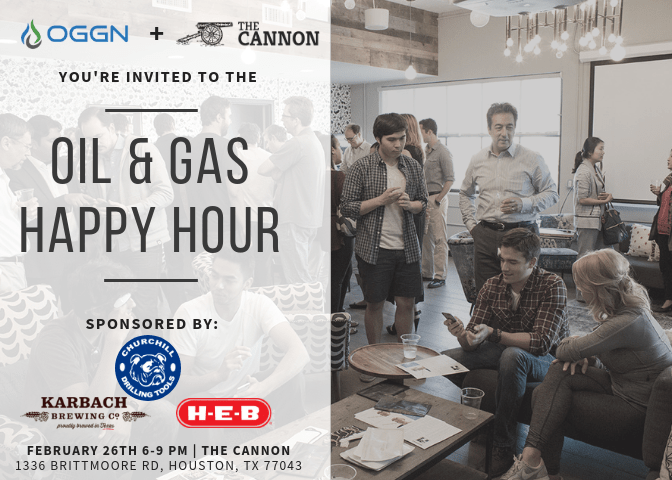 Oil & Gas Global Network is hosting a happy hour on February 26th, from 6-9 PM. Come out and enjoy a cold beer, food will be provided, and network with other professionals in oil & gas! This month’s happy hour will be held at The Cannon. This month’s happy hour is brought to you by Churchill Drilling Tools, HEB and Karbach Brewery. Churchill Drilling Tools- Churchill Drilling Tools is a specialist oilfield service company which delivers innovative solutions to the industry. Primarily using down-hole tools which are activated by pumping darts from surface, we offer operators higher levels of performance and reliability on range of specific operations and contingencies. Find out more here. IBM Giveaway — Coming Soon! Be on the lookout for our upcoming giveaway with our new sponsor, IBM! We are excited to announce we have launched a new podcast! Oil and Gas Legal Risk Podcast hosted by Sarah Stogner. You can listen and subscribe here. Her podcast will showcase stories and tips/advice for everything to do with legal in Oil and Gas. Startups, Energy & Engineering Corporates and the Investment community all come together to catch up on the latest in energy digital innovation and emerging tech. Each Energy Tech Night offers insights from energy digitalization experts and rapid fire pitches from the cutting edge in startups offering solutions for the energy challenges of today & tomorrow. Join us for the first ever SPE GCS Inter-Corporate TopGolf Tournament / Networking Event on Thursday 21st Feb 2019 from 5pm to 8pm. Meet and network with 500+ oil & gas professionals from all disciplines and all experience levels while noshing on hors d’oeurves and playing in the TopGolf tournament. Sponsors will be recognized and prizes will be awarded at a special reception following the tournament! The Innovation and Entrepreneurship Symposium is an excellent opportunity for operators, oilfield service companies, investors, entrepreneurs, and innovators to learn about new innovations from startup organizations.